Clearing Up the Confusion about Climate Sensitivity | Global Warming: Man or Myth? In a few recent conversations with press contacts it has become clear that there is confusion regarding climate sensitivity. More specifically, the confusion is about equilibrium climate sensitivity vs. transient climate response. I will try to set the record straight here. The confusion occurs because many people believe that the moment CO2 levels reach 560 ppm the climate will be about 3C warmer. No. It takes decades for the climate to catch up. The value of 3C also assumes that CO2 concentrations will remain at that constant level until the climate catches up. Doubtful. It is very likely larger than 1C (1.8F) and very unlikely greater than 3C (4.8F). The simplest way to look at this is that the planetary system (ocean, surface, air) is warming because, due to increased heat trapping from gases such as CO2, the outgoing heat to space is not as large as the incoming heat from the sun. This means that the entire system has extra heat. We see that extra heat going into the oceans that are warming, the air that is warming, and the ice that is melting. To establish a thermal equilibrium (outgoing heat equals incoming heat) the entire planetary system must reach a new higher T. Most of the net heat imbalance caused by increasing CO2 is going into the oceans. This will continue until the surface ocean warms up enough to balance the radiative forcing. (Thanks to Gavin Schmidt for the previous two sentences.) For these reasons, one often hears that “there is about 0.6C (1F) warming still in the pipeline even if we stop adding CO2 today.” See: Hansen et al. (2005) for the details. Unfortunately, we are increasing our CO2 emission rates thus trapping more and more heat which means the upward trend in ocean heat content, global air T, and ice melt will continue. The climate is still playing catch-up and will do so until we level off CO2 values and start to bring them down. Even then, there will still be warming from “the pipeline” due to the heat imbalance of previous decades. So what temperature changes are expected down the road? The two graphics below from the IPCC (2007) show projected changes in T following various CO2 emission paths. Sadly, we are currently on the high emission path. Thanks for this. You might be interested in visiting my page http://climateinsight.wordpress.com/science/greenhouse-gases/ and especially figures 4 – 7. I got tired of a climate sensitivity disinformation series of discussions in commentary on the Globe and Mail and decided to do a “keep it simple” analysis, using only measurements of atmospheric CO2 concentration and global average annual temperature anomaly (NOAA data). Using MS Excel, I did a few correlation least squares fit for a logarithmic relationship and varying lag times. While I didn’t go as far out as several decades, I did find a higher correlation ten years later in temperature from earlier CO2. The R² goodness of fit came out to about 0.86 and showing a sensitivity of about 2.6 Celsius degrees for a doubling of CO2, well within the expected range. Figure 6 plots that curve against the raw temperature data and figure 7 plots the “residuals” – the differences between the modeled fit and the raw data. 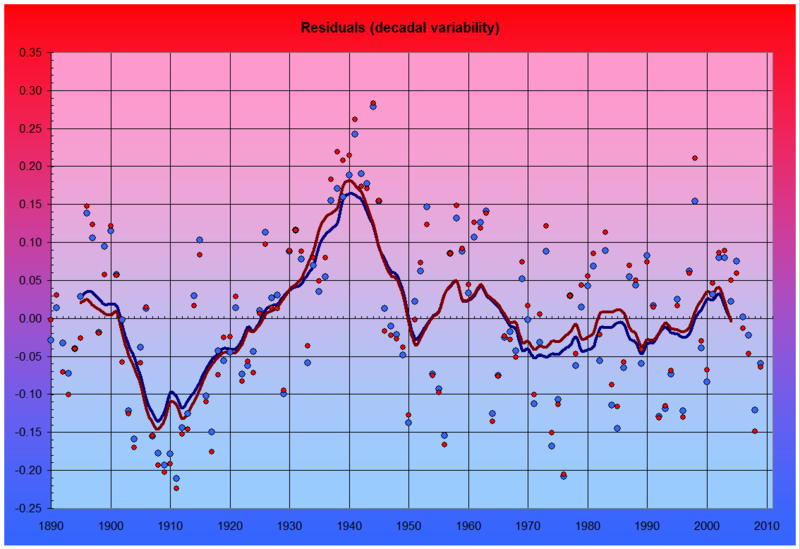 It shows a large variability from 1880 up to about 1950 with dramatically less since. I don’t think that it would be too much of a stretch to suggest that recent decadal variability is relatively small and that the long-term rise is continuing – the warming is only being masked occasionally. Oops – a small error – the R² goodness of fit came out to about 0.84, not 0.86. Mandia: “Global Warming Hoax” comments are not allowed here. Paul, your claims are false and unsubstantiated. Milankovich and sunspot cycles are taken into account in the models and have very little to do with the current warming. There is no hoax are your posturing is irresponsible given overwhelming unrefuted scientific evidence. You can scores of citations to such evidence from reputable journals on my site Climate Insight”. If you are able to present refuting evidence, please do so otherwise you’re just engaging in a troll’s rant, devoid of objectivity. There are none so blind as those who will not see. Failure to act to mitigate the impact and adapt to now-inevitable consequences will far outweigh the minor cost of migrating to sustainable energy sources, improving energy efficiency and reducing GHG emissions. Sorry Mandia – go ahead and delete my rebuttal if you wish. Sunspot activity correlates to temperatures, accumulated cyclone energy, number of tropical storms and hurricanes, glacier melt. Mandia: Not true for the past 30 years. In fact, for the past several years we have been in the deepest solar minimum in over 100 years and yet the climate continues to warm and set global records. BTW, 2010 was tied for the third most active hurricane season and 2005 was number 1. Both occurred at low sunspot activity, especially 2010. The ;an 2009 paper certified by Congress. The other is going through the mill. Mandia: Cite them please but two papers hardly overturn the thousands that state otherwise. Your CO2 is probably coming from glacier and Polar Ice Cap melt. Mandia: The human fingerprint on the carbon in the air and oceans is well-documented. You put all your bets on less than one percent of our atmosphere. There are a half dozen other players in global warming and cooling. In about 10,000 years, it all freezes out and the Good Lord starts over again. Mandia: Sounds as if you think it is OK to sacrifice millions in the next century and beyond because Nature will reset the clock in 10,000 years? You cannot possibly have children. You will come to the point that you will miss this global warming. For us who lived through winters without summers 40 years ago think you need a reality check. It is coming. Something you can tell your grand kids about. I have a blog post waiting to go that I wrote for somebody else but it will be perfect for you also. The deal is that you must read not only what I put in that blog post but also carefully read the many links that go with it before you comment. There is something a bit more pressing that requires a new post today. A non-scientist has made a very large and very public mistake. My deepest apologies. I was preparing a paper for the 3rd International Conference on Hurricanes to presented in Rhodes, Greece in June/July 2011. Please see latest work at nationalforestlawblog.com under Sun Hotz license plate. You can’t say on one hand that if co2 were to be reduced the temperature would still continue to rise and then say on the other hand that the sun cycle has been low for 2 years and then expect an immediate fall in temperatures! The lag due to the heat in the ocean would be same in both cases. See latest paper at nationalforestlawblog.com and read the first hundred pages of The Little Ice Age by Brian Fagan. I may have to speciify the difference between USA drought and the European Drought. They many pick up numerous tropical storms which cause too much rain for crops and in turn, famine. Mandia: This is great and I will be sending this to my various science and media lists. Thank you. Mandia: The US oil industry receives tax subsidies from the government (meaning your pocket and mine) to a tune of about $80 billion per year. That is just under $220 million PER DAY. Climate research in the US received $1.83 billion in 2008. That equates to $5 million per day. So you and are paying the businesses that are producing the carbon that is causing climate disruption 16x what we are paying for the research that is trying to figure out how bad things are going to get and what we may do to fix the coming crisis. Initially, I was shocked by your NOAA graphic of OHC versus time. It almost turned me back into a believer. At first sight OHC had nearly trebled in the last half of the last century. I looked for a weakness of course, I’m a sceptic, never used to be but once I’d differentiated BS from local wind it’s no easy to trust the trust me ‘cos I iz a climatologist nose-wrinkling. Once I had determined that you’d mis-labelled the y-axis from NOAA, that’s bad, or had not, that’s even worse, I relaxed. You showed relative OHC to circa 1980 and said it was absolute. A bit like looking at a ruler under a high-powered microscope and tutting about how irregular it appeared! If you had added the 1980 OHC baseline to your graphic then I would have been impressed. You didn’t and I wasn’t. Loved your excel-ent graphics that showed where Global Warming went. 92% into the oceans, fantastic and meaningless. Show me the spreadsheet circles before AGW or whatever you’ve redefined it as, then maybe I’ll be impressed. But of course, that data has been eaten by Cerebus. 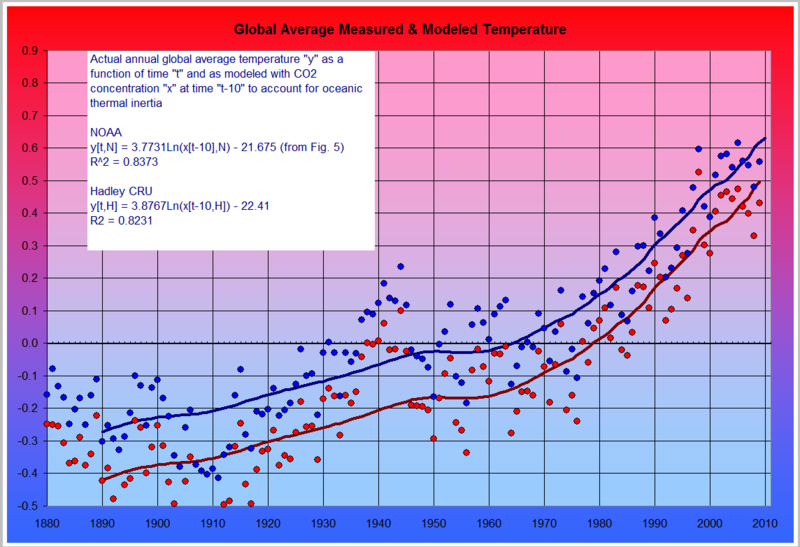 Mandia: The graph is unaltered and comes driectly from NOAA here. I have more information about ocean heat content and the other multiple lines of evidence that the planet is warming on my Modern Day Climate Change page. That the climate system (ocean, land, ice, and air) is warming is unequivocal. I’m less than impressed Scott. Do better next time if you want to disassociate yourself from your less salubrious associates. I see that Roy has done Denialism 101 – he learned to attack on a point of trivia rather than the factual content, adopt an air of intellectual superiority (even with the most obtuse of comments), hint at dark deeds (“less salubrious associates”) and end on the main meme – “I’m not convinced”. Well, Roy, you rhetoric is impressive (good homework) but scientifically worthless. The chart has been labelled as the NOAA labelled it … and what others points did you make, anyway? And don’t you just love it when they use the “open-minded,sceptic,RATIONAL Environmentalist” Ploy.O wise one,thank you,Thank You, THANK YOU!! for coming down from on high (Cloudcuckooland? )and saving us poor benighted mortals by suggesting we do something NONE of us (not a SINGLE one) have ever,ever ever even considered doing let alone ever,ever,ever actually done do’ed. is also “transient climate response”. Mandia: Yes, and I thank you for correcting my mistake. Superb article, thanks. Found it linked on Skeptical Science. Scott, Your plot for ocean heat content goes from 1955 to 2010. Was the coverage the same throughout those years? How deep was the temperature measured ? Are the sensors deep enough to measure the heat of the entire ocean ? While it is quite obvious that the specific heat capacity of the oceans is orders of magnitude greater than that of the atmosphere, can you enlighten me with respect to the time constants involved when it comes to transmitting heat below the thermocline? The first transatlantic telegraph cable was laid in 1858. At that time it was known that the temperature below 1,000 feet in that ocean was about 4 degrees Centigrade. One hundred and fifty two years later the deep ocean temperature remains unchanged so the “Delta T” is restricted to a pretty thin skin of ocean at least in century timescales. Another way to appreciate the heat content of the ocean is to recognize that the atmospheric pressure at what is now sea level would be 600 bars if the oceans evaporated. The specific heat of vaporization of water is 540 calories per gram……………. Discussing the lagged response to forcing from thermal inertia in the oceans with a skeptic, he pointed out that the sea surface is warmer than the near-surface atmosphere (global averages, NOAA cited) and questioned how an atmospheric forcing could warm the oceans, when heat must flow from a warmer body to a cooler one. If the (globally averaged) sea surface is warmer than the near-surface atmosphere, how can the atmosphere warm the oceans? My guess is the answer is circulation – that there are times and places when the sea surface is cooler than the adjacent atmosphere, and the extra heat in the atmosphere is taken up by the surface and mixed down into the deeper oceans (via wind waves and currents). It would be great to be pointed in the direction of online material that explicates at this level of detail. What and where (and when), exactly are the ‘pipelines’? The biggest factor is the absorption directly of sunlight which warms the water. The transfer of heat from the atmosphere to the oceans is miniscule in comparison. The Arctic ocean is a case in point; as we lose sea ice the albedo drops and the water absorbs more heat, which accelerates the melting of the ice – a positive feedback effect. The simplest way to look at this (and I cheated a bit with the coffee cup example to keep it simple) is that the climate system (ocean, surface, air) are warming because, due to increased forcing from GHGs, the outgoing heat to space is not as large as the incoming heat from the sun. To establish a thermal equilibrium the entire climate system must reach a new higher T. It is not really the air that is heating the oceans. I am going to have to redo the explanation in this post but am still trying to figure out how to make it simple to understand. BTW, all three heat transfers (conduction, radiation and latent) are involved but it appears that latent heat released by condensing water vapor is what provides the air with most of the heat that originated in the ocean. Globally averaged values: Conduction adds 24 watts per square meter to the air, net back radiation warms the air by 66 watts per square meter, heat loss by evaporation is 78 watts per square meter. Thanks, Scott. This link was exactly what I was looking for. Perhaps I can assist in marshaling your next explanation by explaining how the thinking went for us lay people…. The first misunderstanding, as you pointed out, was that the main dynamic is atmosphere transferring heat to the oceans. There is so much focus in the popular and semi-popular literature (blogs etc) on atmospheric temperatures rising from Greenhouse gases, the impression formed is that the forcing happens in the atmosphere, and therefore most of the heating occurs there and flows to the oceans. My new understanding (rightly or wrongly) is that the whole ocean/atmosphere(/land) system is affected by upwelling IR more and more impeded by GHGs – not just the atmosphere. Long-wave IR is bounced back (and in other directions) by more GHG molecules absorbing and re-emitting. This puts a new spin, for me, on the saturated argument. If the atmosphere is opaque at ~15 microns, then the re-emitted IR is going back more strongly into the oceans. A lot of skeptics I’ve encountered imagine that ‘saturated’ = the molecules absorb IR and retain it. Assuming sunlight to be constant, the extra down-welling IR from increased GHG adds to the sum of heat being absorbed by the oceans. Pondering the assumption leads me to consider Lindzen’s much-refuted thesis that a cloudier world will arise from more water vapour in the atmosphere, and less sunlight getting through, offsetting the warming. (I’m familiar with the rebuttals, and that is a different subject – I’m just following through the best skeptical logic as I understand it). I have a follow-up question, or muse, if you like. Because the sea surface warms more slowly than the near-surface atmosphere, there may come a time when the near-surface atmosphere is warmer than the sea surface. I wonder if anything will change at that point. Not sure if I’ve used the terminology precisely – I don’t have quite the ken to differentiate between the terms ‘heat’ and ‘energy’ properly, for example – but I hope my attempt at understanding is useful in some way when preparing future explanations of ocean/atmosphere heat transfer, thermal inertia and the lag effect for lay audiences. Thanks again for the links – they are just the ticket. I might have misinterpreted your comment barry but I’d just like to note that GHGs are transparent to incoming visible-range sunlight but not to that which is re-radiated as infrared (heat). Incoming sunlight warms the oceans directly and some of that heat is released to the atmosphere, especially through heat released when water vapour (usually from evaporation at the oceans’ surface) is converted to liquid (e.g., as rain). No, you understood me the first time. Any following confusion owes no doubt to me reaching beyond my grasp when trying to write out my thoughts. I’ve read up on the subject of climate change fairly intensely for three years, along the way trying to fathom radiation dynamics and energy flux in the atmosphere (including formal studies; eg, Ramanathan ’78), not that I have the mathematical or physics education to do more than try to grasp things qualitatively. I’m slightly better informed than the lay audience you’re probably aiming at, but only enough to maybe articulate the conceptual difficulties we non-scientists have. I’m well aware that short-wave radiation (sunlight) is, for the most part, unhindered through the atmosphere, and that the ‘greenhouse effect’ is result of long-wave IR absorption by greenhouse gases, that a real greenhouse operates differently, that the effect in the atmosphere is logarithmic, and that part of the warming near the surface is due to the increasing height at the top of the troposphere. I also have just enough ken to be aware that the lapse rate will not be constant in a warming world, and that the difference will be a very small negative feedback…. Much can be gleaned conceptually from blogs and brain-defeating studies, but the more questions asked, the further one drills down, the harder it is to ‘see’ the climate system in all its complexity. As long as the general public is curious, and even combative, blogs like yours will have plenty to offer. Some of your questions about the GHE are answered there. Thanks for your response Scott about your graphic being lifted direct from NOAA. I thought you were being deceitful, I was totally wrong and did you a massive inservice. Please accept my apologies. I’m now more worried than I was earlier. Why have NOAA misleadingly mis-labelled the y-axis of the graph? I’m guessing that they meant relative OHC divergences from a base-line but that’s not what they stated. I misjudged you Scott but, mainly, because I had associated you with an establishment position of sloppiness that you are innocent of. Toby, you have a point. I did attack Scott for the wrong reasons and I apologised. The labelling if the Y-axis was not a trivial point to me, however. When, after Scott’s invitation, I looked at his post this graphic shook me to the core. At first, I took it at face value. OHC had seemingly increased nearly Three-fold or so since 1980. Once I’d worked out that negative OHC was physically impossible in an absolute sense I calmed down a tad. The y-axis was incorrect and I’m sorry that I dissed Scott as I did. A government agency should have better quality data than this or it just adds to my confirmation bias that I can’t trust the trustees. It didn’t seem trivial to me. The anomalies are based on the reference period 1955–2006 so negative numbers mean less heat than the average value during that period. Ken, I can’t respond directly with substantiation to your question, unfortunately. I will observe, however, that there is a fundamental difference between using fossil fuels like oil and self-sustaining fuels like wood. The difference is keeping a balance between production and absorption. Wood, assuming that the forests haven’t been cut down, recycles the carbon. Fossil fuels on the other hand release hundreds of millions of years of carbon over the space of a century or so. Equilibrium doesn’t exist- we’re pumping it much faster than it can be absorbed. If you can do it, stick with a modern wood stove, either as a local or general source for your home. There’s some chance that the tress around you will keep things in balance. How did you like this winter. We pretty much lost the gains of the lst 100 years in temps. Since 2000, winter temps dropped 6 degrees. Last several years of annual temps following right along and that includes summer temps since 2006. The only thing changing the dynamic is the lack of sunspot activity. The greenhouse theory has about five years left. One must have the an open forum. You have the right to ownership of your blog, but you have failed your students and the public by snipping my comments. I give your blog about five years before it runs its course. Your theory of global warming based on men is about to run out of steam. Mandia: You have confused weather with climate. In fact, this year northern Greenland and Canada were setting record high temperatures. Paul I suggest that you look online for discussions of the “Greenland block” and Arctic oscillation. The cold which has hit Europe and North America is a direct result of changes in atmospheric circulation, bringing cold Arctic air south because of a high-pressure area over Greenland. As proven by Sir Richard Gregory in 1920s, water levels of Lake Victoria matched sunspot activity. As for CO2 being released from the Ice Sheets, Glaciers and such has been ignored for the popular Carbon Foot Print. Now, Tell me, after years of this carbon propaganda, How has America changed other than for shipping our manufacturing jobs over seas? Well we have green cars. Have to plug them in. We have wind power, which is killing millions of birds. We have recycle centers that have state congress blocking private companies from entering the business for recycling is the only governement job that pays for itself. Let’s go to high teck bulbs. Now, we need to recycle high teck bulbs. We are closing down Atomic plants faster than we are replacing them. We are pumbing CO2 into the ground, though it weights heavier than Nitrogen or Oxygen. We are worried about nothing. Al Gore refuses to be sworn in at Congressional hearings while we are in a drought that is eating up our corn that should be going on people’s tables not into cars. The USA has not changed. This solar sunspot minimum will drive the train. WE WILL NOT CHANGE UNLESS FORCED TO AND THERE IS NOT A LAWYER, JUDGE, CONGRESSMAN OR PRESIDENT THAT CAN OR WILL DO IT. That goes for both sides of the political court. Greentainable World » What Is Global Warming And Climate Change?